First of all, I'm sorry Mom that you are just now learning about this. Would you believe me if I said I have forgotten to tell you? I sowwy. Second of all, check this out - this little incident took place exactly TWO YEARS to the date of the last "incident." Yep. How about that? If you think I ever plan to operate a motor vehicle again on October 1, you are crazy. On this particular sunny Friday, I was having lunch with a friend to talk about a favor I was doing for him. He was kind enough to buy my lunch and while I was there, I saw another friend. It was shaping up to be a good day. After lunch, I got in my car, backed out of my parking space, and just as I was about to throw it in drive, I noticed the bimbo driving backwards through the parking lot. Did she see me? She wasn't slowing down. At this point, my car is perfectly still - wondering if I had time to move out of her way, or if she in fact saw me. I honked the horn a few times. Nothing. She didn't see me. Faster and closer she came. Then - CRUNCH. She hit me. I watched her back right into me. So my car now has a hole in it. Her car has a SCRATCH. The laws of physics prove that she hit me, something that she would not admit to me or eventually, my superstar insurance agent. So fast forward a few weeks and once again, Sam is helping me take care of this. Let me give the single girls reading this some advice - find a guy friend that sells auto insurance, and buy it from him. It makes everything so much less scary and intimidating. It has been SO HELPFUL having a real, live friend to call when bad things happen to my car. We all know I don't have a husband to call, like the bimbo who may or may not have been on her phone when she backed into me, but I did call Sam. So yesterday he connected me to the claims people who set up an appointment on next Wednesday to have the car looked at by someone that looks at cars for a living (do you see why I need someone to help me with this?). At that point, this guy is supposed to be able to write me a check on the spot for what the damage estimate is, less my super duper low deductible because I am apparently enrolled in something called Platinum Protection which offers a Safe Driving bonus so every enrollment period that I don't have a wreck, I knock $50 off my deductible. 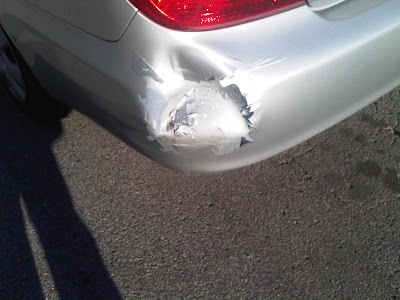 And that also means that my monthly premiums won't increase just because I was involved in this little fender bender (even though it wasn't my fault). From there, I will take it to a body shop, get the repairs done and the little car will be as good as new for another two years. After I was all finished with the claims lady, Sam got back on the phone and we talked about football and our family. Did you know that my grandmother played matchmaker and set his parents up on their very first date? Wouldn't it be nice if he would return the favor and set me up on a blind date? You would think. So anyway, that's what else has been going on, in addition to all that Green I told you about. Don't worry MOM, this won't be the only thing I talk about for weeks. ugh parking lots. at least you witnessed the incident. unlike me who came out of Target to find my PARKED car with a nice, fresh (big) ding in the side. everyone says that the first ding your new car gets will hurt, and it did (does). but, what can I do? it's just a car! woohoo!! no show sam shows up when it matters!